In 2004 the next generation came to visit Germany. 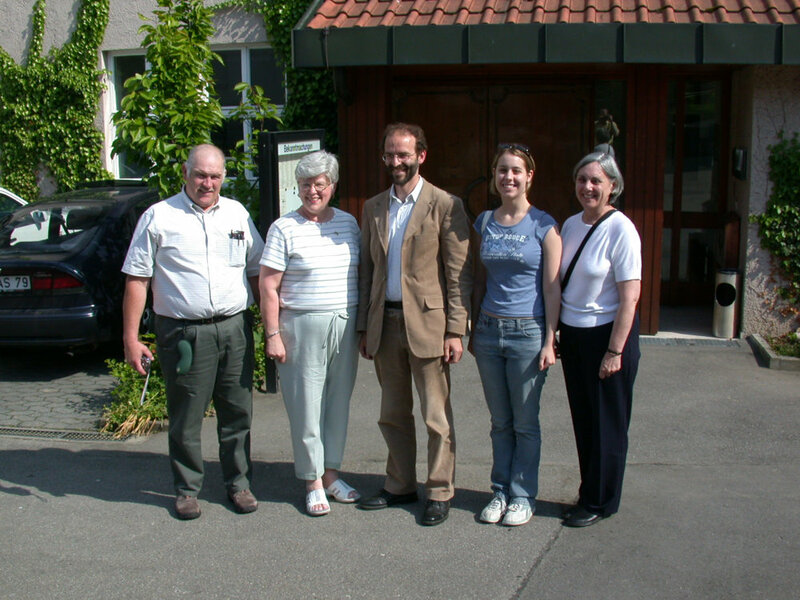 After their parents Charles and Betty Walker in 2002, Brenda Kearns with her husband John and her cousin Gena Schantz with her daughther Kerry visited us in May 20004. Brenda is the great-great-daughter of Johann Friedrich Walker, who emigrated in 1865 and Gena is the great-great-daughter of Johann Friedrichs brother, Johann Jacob Walker, who followed his brother in 1874. Both brothers settled in Hartford City, Blackford Co., IN.Our guests were staying with their cousin Gerda Hipp-Gruner in Wannweil after they arrived at the Munich airport on May 25th . After a refreshment and a light snack we made a little walk around the Blutenburg castle to stretch legs before we went on the two hour drive to Wannweil. Naturally we had prepared an interesting schedule for our guests and I would only highlight some of the activities. 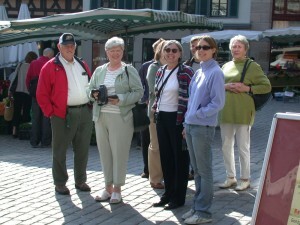 On the next day we made a city tour trough Tuebingen. Something you shouldn’t miss is the market place and the city hall in Tuebingen. 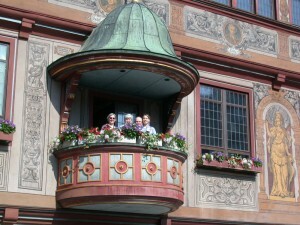 Our guest could even enter the balcony and have a great view overlooking the whole market place. Another thing you shouldn’t miss in Tuebingen is a ride on the Neckar with the special student boats called “Stocherkahn”. By the way there is an annual race between the various student groups comparable the rawing race between Oxford vs Cambridge. If you want to see more I would recommend the following video on Youtube. In the afternoon the Mayor Dr. Juergen Soltau welcomed the guests on behalf of the city of Kusterdingen. For this meeting we also invited Monica Schmid, the secretary of the parish in Wankheim and the local press, the Reutlinger Generalanzeiger. They published a long article about the visit on May 29th. After the visit to the city hall we visited the old house where Caspar Walker in the Scherrgasse 27. Caspar Walker is another ancestor from Kusterdingen. The next day we made trip to Heidelberg to visit the city and the famous castle. On Friday we had a tour through the church in Wankheim guided by Joe Seubert. In the afternoon we meet with members of the Historical Society in the Klosterhof where Manfred Wandel the president of the Historical Society and Mr. Shorer provided us with interesting insights to the local history. The day was closed by some sightseeing in Reutlingen, including the local newspaper where Gerda was working. On Saturday we made a trip to the Hohenzollern castle and the Schwaebische Alb. Sunday was reserved for the service in the church of Wankheim and the celebration of Martin Hipp’s birthday. On Monday our guest had to say goodbye to their relatives in Wannweil. Via the stud of Wuerttemberg in Marbach and the monastary in Ottobeuren we returned to Munich. The next day was reserved for some sightseeing in Munich before they also have to return home to the U.S. on June 2nd. The time passed so quickly and I hope we can welcome them again soon in the future.